Beautiful hotel in the center of Antigua Guatemala’s colonial history. Located in the restored ruins of the Convent of Santa Catalina, under the famous Arch, the most famous of all Antigua’s landmarks. Our goal is to make your stay as comfortable as possible, while enjoying our great city. Hotel Convento Santa Catalina combines modern comforts with the charm of Antigua’s colonial era. We offer everything that you could need during your stay in Antigua. Travel Agency to help with any tours or ongoing travel. Airport pickup for $37. Parking space is limited and requires reservation. In our properties group we offer 11 hotels and 2 sets of vacation rental apartments: Three 4-star hotels (1 with suites, 1 with a swimming pool and spa, and 1 set in the colonial ruins of a historical convent), two 3. 5-star hotels, three 3-star hotels, three 2. 5-star hotels. All of our hotels are within 4 blocks of each other and within 3 blocks of Antigua's beautiful central park. We have over 225 rooms and can accommodate up to 750 people. So, we can accommodate large groups in one single hotel or very large groups between a few of our hotels. Even if your group is split between a few of our hotels, you would never be more than a 3 minute walk from the rest of your group, since our hotels are very close to each other and very centrally located to the central park of Antigua. Also, if your group is interested in meal plans, we can provide breakfast, lunch and dinner. 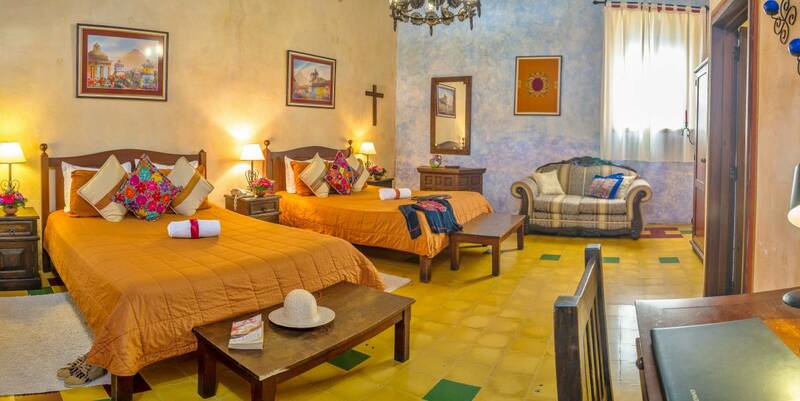 In Hotel Convento, we can offer single, double, triple or quad rooms with private bathrooms. We offer all private & comfortable rooms, 17 rooms in all. 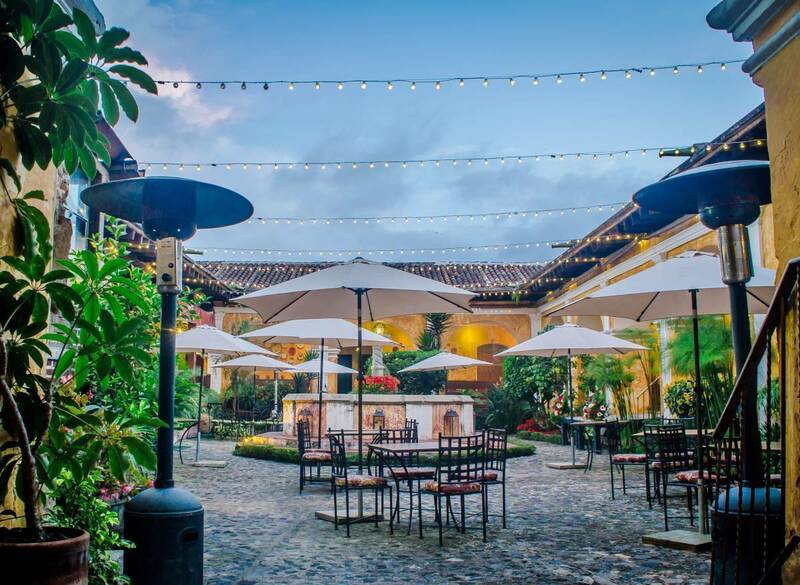 Hotel Convento Santa Catalina is a tranquil hotel in the heart of Antigua. Our hotel is full of the history that makes Antigua Guatemala an international tourist destination. Our unique hotel is set among the ruins of the convent built for the cloistered nuns order of Santa Catalina. This is probably the most historical property you will find in Antigua Guatemala. The Arch is definitely the most famous and most photographed icon of Antigua. The cloistered order of Santa Catalina began in 1609 in Antigua Guatemala. Their convent, where the hotel is today, began being built in 1613 and was completed in 1647. This is one thing that makes our hotel different, and not many other hotels in the world are like this. So, when we say our hotel has history, we mean over 400 years of history within our hotel walls. Most of the ruins are very weel kept and in their original state. The famous Arch, which was built in 1693, has a passageway inside of it and was used by the nuns to cross over the street to their property on the other side. This way, they could stay out of public site, which was part of their cloistered order. We are located on the most famous street, Arch Street, in the entire country of Guatemala. And there is more, the most famous historical monument of Antigua Guatemala is part of our historical hotel. The hotel rooms are situated around a large central courtyard with a beautiful fountain that harnesses the feel of a time long passed. 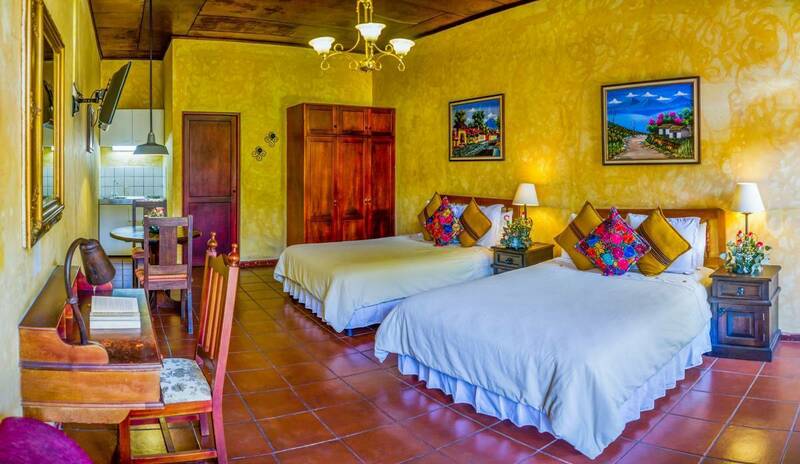 Our rooms and common areas are decorated with beautiful Guatemalan furniture and textiles and many priceless antiques. They are spacious with lots of light and bright colors. All rooms come with private bath, cable TV, hot water, linens, towels, soap and window views. They all have furniture for hanging and folding clothes. All rooms have many hand carved wood furniture pieces and breathtaking chandeliers. Some rooms have views of the colonial ruins. All rooms are well lit with ceiling lights and beautiful hand made lamps on the night stands, beside all beds. Our garden has many sitting areas for relaxing or reading a good book. It is easy to keep in touch, while you are here, with our free Wi-Fi internet. We also offer a Travel Agency, airport pickup, use of a shared kitchen, laundry service, bag storage, Spanish classes and a large garden sitting area. Our bi-lingual staff will help you with all your needs and give you good tourist info. For families with children, we offer pack-n-play baby beds and a family friendly environment. Our bi-lingual staff will help you with all your needs and answer any questions you have during your stay with us. 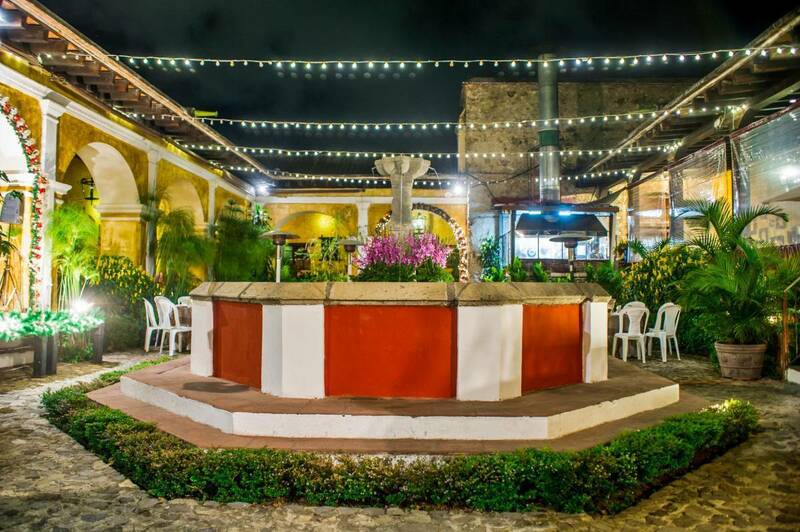 Our restaurant, Restaurante El Arco, was founded in 2005. 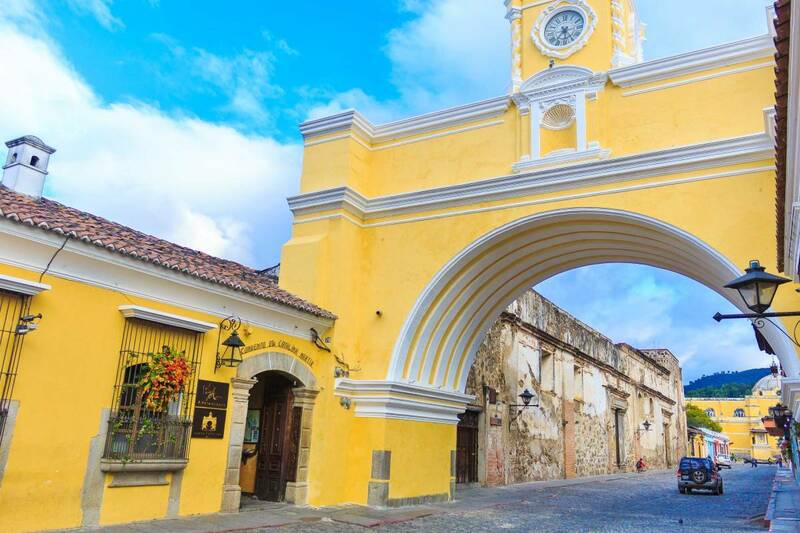 It is named after the main icon of our beautiful city of Antigua "El Arco". It is located in the main entrance of the hotel and sprals through one corridor and the central garden area. We offer a delicious and varied menu of international cuisine and Guatemala typical dishes. This guarantees you a memorable dining experience and excellent service. Our Junior suite is unique in its type. It was the Principal’s Office of the Convent at the beginning of the 17th Century. It has a king size bed, and in front of it there is a beautiful fireplace. The bathroom has a bathtub with hot water. The room is very large, as are all of our hotel rooms. This room just has some very special history. The hotel rooms are aligned around a beautiful garden and historic ornamental fountain. We offer a variety of rooms, all comfy. 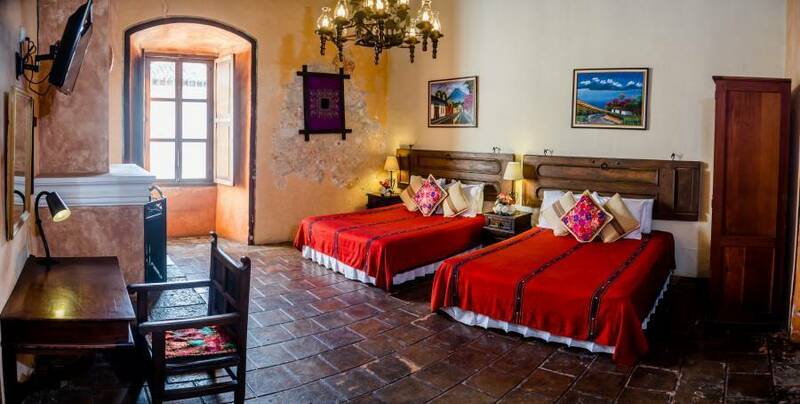 We offer single, double, triple or quad rooms, with private bath & flat screen cable TV's, in a contemporary-modern construction, which contrast very nicely with the Ruins of the Church of the Convent Santa Catalina. All our beds are all anti-stress mattresses with lots of pillows for your comfort. All rooms have closets for hanging your clothing. All have hand made writing desk & chairs, night stands, head boards, iron forged lamps & windows with lots of natural light. Our family room is located in the Colonial area, and is the biggest room in our hotel. It has also a big bathroom with a bathtub decorated in the colonial style. These rooms are around the main garden. They are standard rooms with one, two or three beds. Our hotel is located in the middle of the most famous icon of Antigua, the famous Arch Street, directly under the Arch and clock tower. We have our own famous restaurant in the hotel, El Arco. There are also many nice restaurants within a 3 minute walk from our front door, as well as tons of shopping and little quaint cafes. Our Restaurant “El Arco”. It is located in the main entrance of the hotel and sprals through one corridor and the central garden area. We offer a delicious and varied menu of international cuisine and Guatemala typical dishes. We are located on the most famous street, Arch Street, in the entire country of Guatemala. And there is more, the most famous historical monument of Antigua Guatemala (The Arch with the clock tower) is part of our historical hotel. If you are planning your own way, from Guatemala City airport, take a shuttle or drive to Antigua (45 minutes) via Calzada Roosevelt. Enter into Antigua, via 3rd Calle. You need to turn right on 5th Ave, go 1 and a half block and Hotel Convento Santa Catalina is on your left at 5th Ave Norte #28, directly under the Arch. We offer private airport pickups for $37. This price is for 1 to 3 hotel guest. For larger groups, it is $8 extra per person. For this service, please send your (arrival time, flight #, airline name and from what city you are arriving from) via email at hotelconventosantacatalina@hotmail. We also have a full service travel agency at hotel reception, where you can reserve a tour or shuttle bus to anywhere in Central America.